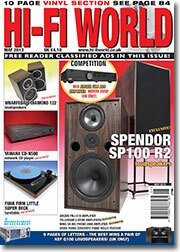 Celebrating Hi-Fi In This Issue Of Hi-Fi World! 66 Subscriptions: Ensure Your Copy Every Month And Save Money Too! 75, 77 and 79 Opinion: The team get to grips with matters music, hi-fi and life! Noel Keywood visits the vinyl factory to listen.